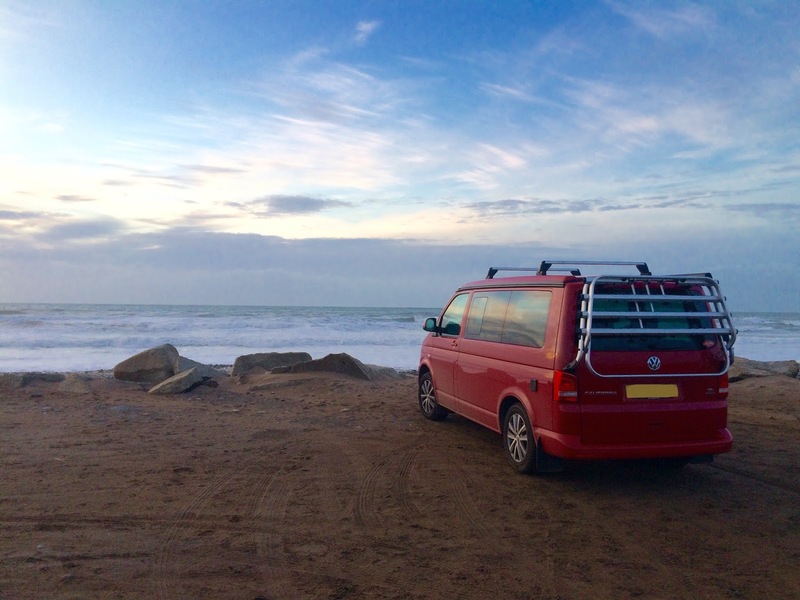 campervanliving: The new ride. A Transit in a posh frock. The new ride. A Transit in a posh frock. We finally took possession of our new ride last week. It’s been an interesting time searching for a camper that’s just right for us – and it coincided perfectly with the work I have been doing for ‘The Camper Van Bible’, my new book. So a lot of the questions we asked ourselves about 'what is right for us' will be in there if you're ever facing the difficult decision to buy a camper. Buying a camper van isn’t like buying a car. There are lots of extra considerations to take into account such as the type of roof to go for, the type of kitchen and the number of people you need to sleep. And that’s once you have decided what kind of a van you’re going to fit it all in. One of the chapters in ‘The Camper Van bible’ deals with exactly the issues I faced when selling our old Type 2 and moving on to our new van, which, incidentally, is a VW T5 California Beach. This is the California without the kitchen and cupboards, although it has camping electrics and two doubles. It is the 140 BHP Bluemotion version with an automatic gearbox, 7 seats and mostly all of the knobs and whistles. That's it above. This year we’ve been fortunate enough to try out a series of motorhomes and van derived campers for a series of articles for Motorhome and Motorcaravan Monthly. We loved the space of the coach built motorhomes but decided they just aren’t right for us after I had to do a 3 point turn in a Cornish lane on a dark and foggy night on the Lizard Peninsula. Mind you, when we took a 4 berth motorhome to the lakes in February we were very glad of the heating and the space. Of all of them I liked the Peugeot Boxer derived Auto-sleeper Warwick Duo the best, but still wouldn’t want to drive it every day. Our T2 was a beautiful van. It still is and we miss it terribly. But, living by the sea meant we had to garage it most of the time. So it became an extra, almost a trailer queen, being driven only on sunny days. I had a golf for every day. But two sets of tax and MOT and insurance are too much to wear. So whatever we went for had to be my daily drive. That meant a Boxer, Sprinter or Crafter – or even a coach built - would be out of the question. We’ve had 3 T25s and one T2 so we’ve been there and done that with the old vans. This time, since we were looking for a daily driver, it would have to be able to rattle up the A30 to the station (in the middle of winter) as much as it would to the South West of France and Northern Spain. We’ve also got ambitions to go to Norway and to go further than ever before, so we need heat, reliability, comfort and a bit of grunt. An old camper just wouldn’t cut it, gorgeous as they are. One of the first issues we had to work out was all about space. We lived in our T2 for 10 weeks over the summer of 2013 so we found out all about the need for space. 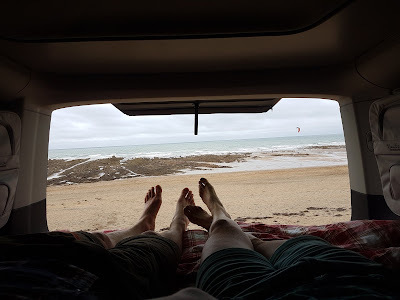 Four people who surf, cycle, swim, snorkel, eat and sleep need a fair bit of space, even though they operate a strict wash-one-wear-one policy at all times (with the exception of the women among us). Our T2 had no roof rack and the bike rack only takes 2 bikes so we had to travel with all that inside the van. Never again! We pondered the need for a long wheel base van for the extra space it would give us. The only issue was the fact that the rear bench seat (rock and roll bed) on a long wheelbase van is right at the back. That means you need long arms to eat at the table and that the kids would be miles away when we travelled – unless we had a sliding seat system. The rock and roll bed is vital to the van. It’s a serious consideration because it’s all about the safety of my nearest and dearest. We wanted something that would be ‘crash tested’ and wouldn’t come flying out of the back of the van at us if we were in an accident. There are lots of great makes out there, including Ribb Altair beds, Bebb beds, Bedrock beds and those on sliding rails like the Reimo Variotech beds or those installed by VW in the Cally. In the end it was a toss up between a Reimo Variotech on rails so we could have the kids closer to us or a Cally, which does the same thing. A major decision in the buying process is what to have for your camping equipment. Our T2 had a full width bed with a kitchen pod at the front end so we didn’t feel the need to go back to a full kitchen with wardrobes etc. The size of the bed was more important than the size of the kitchen. I went to Danbury to take pictures for ‘The Camper Van Bible’, which gave me a chance to nose around their ‘Surf’ model. This has a 3 seat bench seat and a narrow kitchen and is a great van. Then we discovered Slidepods, an option which gave us a good amount of versatility because it means you can turn a standard van into a camper without having to have a full time kitchen. It would also be useful for demos too as it’s outside of the van rather than inside. And it’s removable. We took pictures of the Slidepod for ‘The Camper Van Bible’ and it looks great. We’ll be ordering one in the new year. As someone who has driven old and silly vehicles for all of my life (apart from the Golfs) it’s a revelation having something so modern. Not only do I feel like a grown up (and therefore a fraud) but I also feel like I don’t deserve it, like it’s for someone else. I like the heated seats and the heating and the fact that you can clear the windscreen. I like the fact that it feels safe, that I can hear the stereo and that I can go over 50 miles per hour. And ok, so it’s not got the charm or the style and no one waves or bats an eyelid when we drive past. And we know we’re going to arrive when we set off. And we’ll be able to go far without taking a week to get up to 55. And we’ll be able to carry our surfboards on the roof and all our bikes on the back. And OK, so the T5 has been described as a ‘Transit in a frock’. But so what? The most important thing is that we’re going to be camping more than ever. "The Camper Van Bible" is due out next spring. Interesting post.. We've been thinking along the same lines.. T2 out of the rain in the garage all the time, the safety issues and the repair bills. Not 100% sure about T5's. I've got almost the same level of luxury in my 25 yr old T4 westfalia hightop... although no heated seats unfortunately. I can sometimes even reach 70 MPH on the motorway... yay... and all 4 of us get a comfy bit of bed at night. Congratulations on the new van...New vans are a lot easier and comfortable to drive and in the end you only got the T2 because the BBC wanted it ....A campervan in any guise will be fun. Looking forward to seeing more of the new van. We went through exactly the same process and got the same result (though a different conversion of the T5). Warmth, comfort and usability for camping and as my daily drive. I miss the T2, but it was a lot of work keeping it on the road and repairing it when on trips out. I ended up buying a 72 Beetle to rebuild and regain the fun of the air cooled engine sound and lethal oversteer. Love the Van, it does the job perfectly and I wouldn't change it back, but I do miss the character of a classic car and people waving as you drive past. Looking forward to hearing more of your adventures. I have the exact same camper van in blue and we park on the beaches along the east coast all summer. We recently found a little island in north Florida where you can park the camper van on the beach, sleep, have a camp fire, and it is all for free. This sure beats having to pay $200 a night to stay in a hotel room! Making dreams come true: another slow road adventure.